Cosmo's sister publication Real Living Magazine came up with a nifty book on decorating small spaces. Read about it here, then go grab a copy. It's just P195! Did you just buy your hard-earned first condo or moved out to assert your independence and rented a studio? Or are you so bored and nasisikipan in your room, you want to redecorate? We know that more and more of you, career-driven and independent-minded Cosmo chicks, are opting to live in condominiums, apartments, and single-detached units. With security, convenience, and cost-efficiency as the main reasons, living in small spaces has become a practical choice for a lot of you. But how can you make the most out of small spaces without creating clutter--and in a stylish manner to boot? To answer this, Cosmo's sister publication Real Living Magazine has released its newest book: Real Home Ideas 5: Small Space Solutions. Inspired by the success of its Small Space issue back in 2009, Real Living recognized the growing need to teach people how to live big in confined spaces. Real Home Ideas 5: Small Space Solutions features everything you need to know about maximizing studios to three-bedroom units. With 108 pages of the best small homes featured in Real Living magazine, over 200 colored pictures, 101 decor and storage ideas, and even a do-it-yourself floor plan, the book is every bit a Cosmopolitan chick's dream come true. The book is divided into three parts. The first chapter deals with different kinds of small homes and allows you to identify which type is most identical to the one you own. The second chapter is all about small space tricks, which gives storage and furniture layout ideas. The third and last chapter gives tips on how you can go about renovating a small space and what to remember before retouching a small space home. 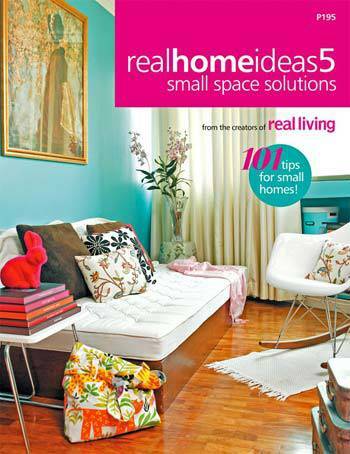 The Real home Ideas 5: Small Space Solutions is now available in bookstores and magazine stands nationwide for P195.